Bullfrogs can become a problem for many reasons. Mostly water dwelling, these frogs will migrate by the thousands when seeking water. They commonly exist in ponds and lakes but adults will forage to new environments when the local water supply isn’t adequate or if they can’t find food. Bullfrogs will readily move into any body of water they find. This includes pools, koi ponds, lakes, streams, swamps, drainage ditches and even bird baths. Bullfrogs will eat most any insect but also love to feast on fish eggs and small fish larvae. When bullfrogs move into ponds used for fish reproduction like those found on fish farms, the damage they do can be costly. For this reason there are several control measures which might have to be done. The first way to control bullfrogs is to install a barrier through which they cannot enter. A very cost effective barrier to use is our high strength VINYL SCREENING. There are many locations where it can be installed to stop invading bullfrogs. If you already have a property fence in place but it’s not keeping them out, the mesh of the wire might be too wide. Add screening to the bottom 24 inches. Be sure to plant at least 6 inches in the ground so no gaps exist. This same screen can be set up to work like a fence. Make sure it’s at least 24 inches tall and 6 inches in the ground. Installing it around any pond or body of water can keep them out. It comes 4 feet wide so you can make a fence tall enough to stop them. To keep bull frogs away without the use of screens, set out PEST RID GRANULES. The goal here is to establish an invisible barrier over which they will not want to enter. So to keep them out, you’ll need to apply the granules where they’re likely to enter property. Also treat around ponds, streams and damp areas they target. 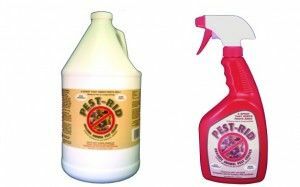 Pest Rid is made from natural ingredients and is federally exempt from needing a registration because its safe for use around people and pets. The mode of action is quite unique. Basically because the ingredients are more concentrated than what normally appears in nature, the target pests get “alarmed” and their natural reaction to “flee” kicks in. Generally they’ll leave where Pest Rid granules and spray has been applied within one day. 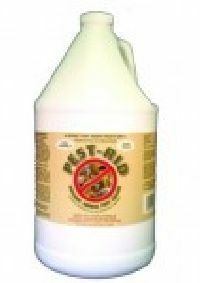 Pest Rid comes in 2 lb jug which will cover up to 500 sq/ft and should be renewed monthly. They serve as the “base” of the treatment by absorbing the Pest Rid spray and keeping it active twice as long compared to just the spray alone. After setting out the granules, spray over the top with PEST RID SPRAY. dUse 32 oz of spray per 125 sq/ft of area; the 1 gallon jug can treat up to 500 sq/ft. Basically you want to spray all areas where the granules have ben applied and any other surfaces you’ve seen bullfrog activity. Like the granules, Pest Rid spray is made from all natural ingredients and exempt from federal registration making it ideal for sensitive areas like ponds. It won’t hurt aquatic life and you’ll get instant results which frogs leaving the area immediately after the treatment is in place. Pest Rid spray will last 4 weeks or more when used with the granules. If used by itself, you’ll need to retreat every 2-3 weeks. But once the frogs have move away, treat every 30 days to insure they don’t return. The quart sized Pest Rid comes with a trigger sprayer on top as seen in the picture. For the gallon, you’ll need a good PUMP SPRAYER to treat. Is this smell something that frogs don’t like? Also, is it a smell that people don’t like? Thanks. Pest Rid has an odor which frogs, snakes and other small animals as well as some insects do not like. They’ll avoid the surfaces and areas where the product is sprayed long after the initial spray is applied. This is because these animals have a strong sense of smell and can detect even tiny amounts of the treatment. As for people; we can smell it when sniffing it from the jar and for a short while when first applied. But within 30 minutes the odor will dissipate and when applied in open outside areas, be gone even faster. So if you’re using it on the home, patio or yard, treat in the morning and by noon you won’t know it’s there. Will the granules get rid of the bull frogs in my small fish pond if I put it around the edge of the pond? Will it hurt my fish? Using Pest Rid won’t chase away the frogs living in the water. You’ll want to first physically remove them from the water and only after they’re gone and relocated should you treat. Now once they’re gone from the pond, the treatments will keep new ones from entering the area. You should also try to identify where they might be coming from (entry points onto your property) and then put the Pest Rid Granules in a line all along these entry ways. These same areas should also be treated with the Pest Rid Spray. The combination of the granules and spray will help keep new ones from entering the area and in the end, help keep the pond bullfrog free. Lastly, treatments done properly won’t pose any hazard to the aquatic life in the pond.